NEW HAVEN, Mo. - At 8 a.m., Tuesday, July 15, the Old New Haven School took on a new look as a steeple was positioned on top of the school’s bell tower. 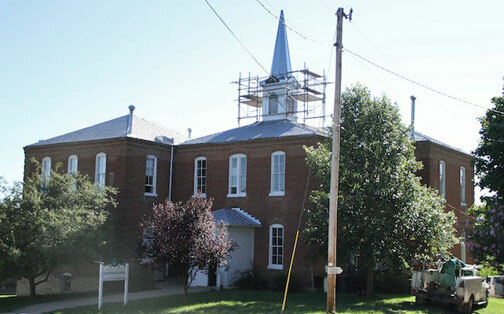 The New Haven Preservation Society decided to have the steeple added to the building after noticing the original photos of the school had a steeple on it. David Menke said the steeple was probably removed sometime in the 1930s because of damage or deterioration. In 2013, the New Haven Preservation Society held a fundraiser to raise money for the steeple. Menke said the fundraiser had a very good response and raised over $10,000 for this project. The preservation society then contracted with Lloyd Borcherding to install the steeple. The steeple is 16 feet tall, five feet in diameter at the base and is capped with stainless steel metal. A lightning rod will also be added to the steeple sometime later this week. A time capsule was placed inside of the steeple. It contains a list of all the donors of the steeple fundraiser, a copy of the New Haven Preservation Society‘s meeting minutes, and other miscellaneous items like coins and a medallion. 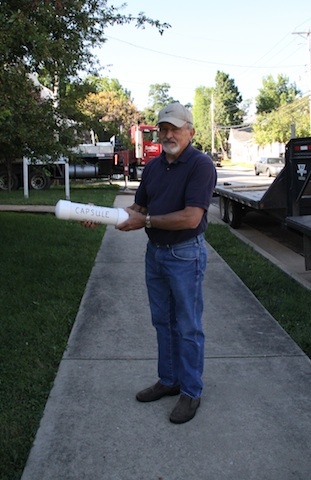 Pictured right, David Menke holding the time capsule that was placed inside the new steeple. After 75 or 80 years, the school has been returned to its original appearance.